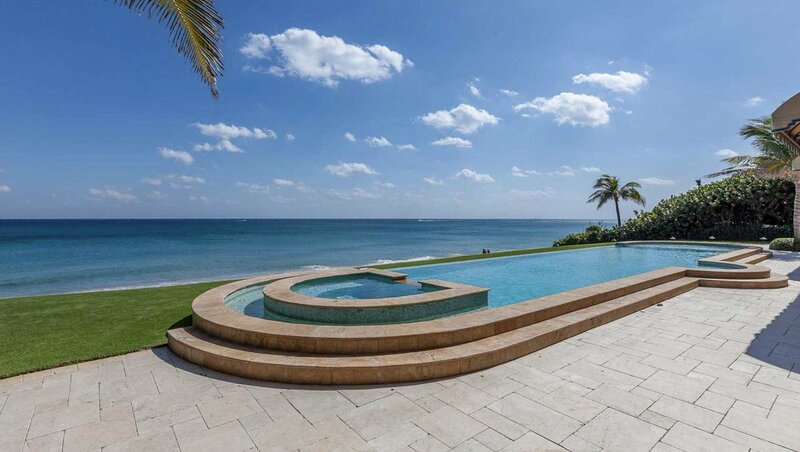 The East Delray Beach waterfront estate at 1001 Vista del Mar is one of the area’s very best luxury homes. 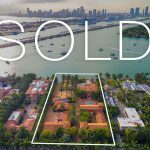 Located just blocks from the beach and East Atlantic Avenue, the property offers 130 feet of direct Intracoastal waterfrontage and endless water vistas. 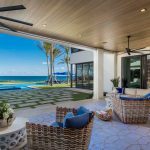 Boasting over 9,000 total square feet and five bedrooms, the Caribbean-style residence was custom built to include the industry’s finest details and finishes. 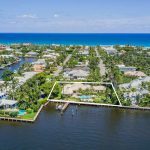 Vista del Mar is one of East Delray Beach’s most coveted streets with a private, one-way loop and lovely two block stroll to the beach. Enjoy the nearby boutiques and restaurants on Atlantic Avenue as well as the pleasant drive along scenic A1A to Palm Beach or Boca Raton. Jetsetters have several local jetports and three international airports conveniently located nearby via Federal Highway or Interstate 95. Boaters can enjoy a day-trip along the Intracoastal Waterway or hit the high seas through the two nearest inlets conveniently located in Boca Raton and Ocean Ridge. Created to exude a casual elegance, the five-star estate enjoys picturesque water and sunset views throughout. The two-story residence offers five bedrooms; six full and three half baths; 6,672 square feet under air; and 9,043 total square feet. Every room in the house reflects the custom finishes and intricate detail including extensive dentil and crown moldings, Crema Valencia marble and hardwood floors with inlay, onyx countertops, Caribbean rosewood and two windowed cupolas with custom lighting. The interior spaces have French doors and oversized windows to allow for natural light and endless water views. The impressive home is graced with sensational curb appeal. The manicured grounds beautifully frame the decorative drive with ample parking in addition to the side-entry three-bay, air conditioned garage. The rotunda foyer with Caribbean rose staircase and windowed cupola above leads to the family room complete with full-service wet bar, soaring ceilings and full wall of windows overlooking the grounds and waterway. The chef’s kitchen features top-of-the-line appliances, island with sink and glass snack bar, custom cabinets, onyx counters, pantry and a spacious casual dining area that opens to the family room. The European sitting room has a gas-burning fireplace and glass doors that open to the covered terrace and pool. The formal dining room is conveniently located down the stately hall from the kitchen with butler’s pantry, bar area and wine cooler. The office overlooks the front grounds with a nearby powder room conveniently located off the foyer. There is a large downstairs bonus room that could serve as a club room or home theatre with French doors that lead to a private terrace with pergola and a powder room across the hall. The downstairs en suite bedroom is conveniently located off the service entrance making it an ideal location for staff. The rosewood staircase beautifully curves to unveil the split landing that leads to the north and south wings with an open loft that overlooks the family room below. The expansive and private master wing enjoys stunning water views, a fireplace, morning bar, French doors to the covered balcony and well-appointed his-and-her marble master bathrooms and walk-in closets. The second level also features three additional en suite bedrooms, laundry room and several access points to the covered balcony with plenty of room for relaxing and taking in the sunset views. Enjoy endless hours of outdoor entertainment with lots of covered and open spaces for lounging and a summer kitchen with grill for al fresco dining. The beach-style heated pool with pebbled finish and cascading rock spa is the perfect spot to enjoy sun and fun with a cabana half-bath nearby. Recreational boaters and serious yachtsmen will both appreciate the 110 feet of private dockage complete with 24,000 pound boat lift, water and electric. Plan sunset cruises along the Intracoastal or venture out to the Atlantic Ocean via nearby inlets in Boca Raton and Ocean Ridge. Convenient amenities include a full-house generator, elevator, security system, central vacuum, electric retractable awnings, five-zone air-conditioning system and three-car garage. 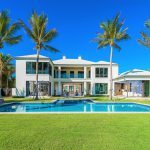 With an exceptional East Delray Beach location and desirable address, this five-star waterfront estate is the quintessential luxury residence. If you would like to tour 1001 Vista del Mar, Delray Beach, please contact Nick Malinosky for details.